The Realis Rozante 63SP is the first of the special brand off the Realis series Grade-A. The beefy body has been equipped with a magnet detaching moving weight system for absolute castability for land based anglers to get their lure out in strong head winds and side winds. Despite the small 63mm body sized, anglers will be able to utilize the finesse bait-tackle. The pulsation created by the lure is more of a short pitched action created by those bait fish trying to get away from a hungry bass, than those weak bait-fish drifting along. This consequently activates the feeding switch for the bass as soon as the lure comes into sight even with simple slow ~ fast retrieval. 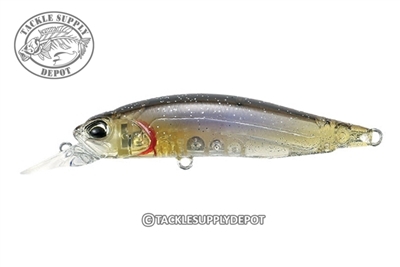 Furthermore, the lure can be worked as a shad type lure with a panicking dart like action through twitching of the rod, enabling anglers to invoke a bite from a bass in the least amount of distance. This lure will surely help those land-based anglers in a linear style of fishing of straight retrieval and a spot-light style of fishing with its panic dart action.